This Thanksgiving Day, I am wearing black and white. No turkey, pumpkin pie or celebrations around a dinner table. Just bananas, rice and salt -- traditional offerings laid out by Cambodians in their individual shrines to honour the victims of Monday's tragic incident that left more than 340 people dead. In stark contrast to other years, we didn’t awaken this morning and prepare festivities for the holiday. 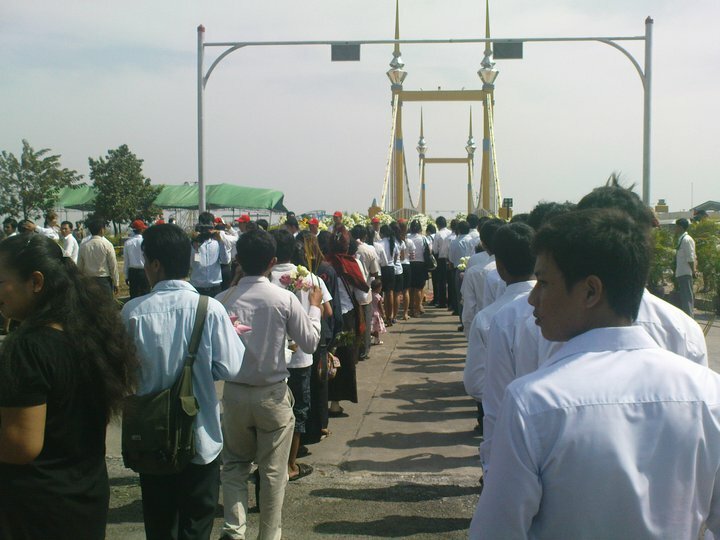 Instead we rode with SamOn, our tuktuk driver friend, to the site of the Diamond Island bridge and watched one of the first memorial ceremonies to take place after the tragedy. At the foot of the bridge, hundred of black and white clad mourners had gathered. But, despite the numbers, the air was silent and the mood sombre. One by one, people from various regions solemnly walked the path to the bridge, carrying single lotus blossoms and sticks of incense, each group following two army officials bearing huge garlands of yellow and white flowers which they laid at the foot of the bridge. 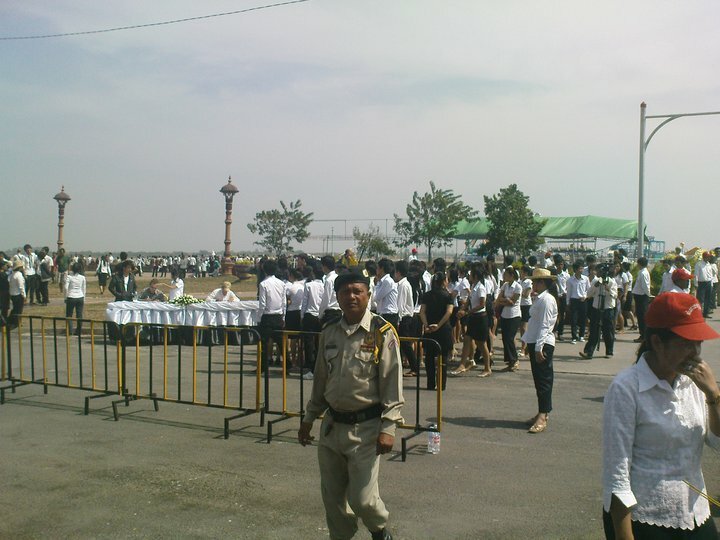 Not being able to read Khmer script, we were unable to tell where the flowered wreaths came from. But one stood out for us. Written in English script it read “Long Beach, California” and was escorted by a tiny group of six – four women, a man and a child. 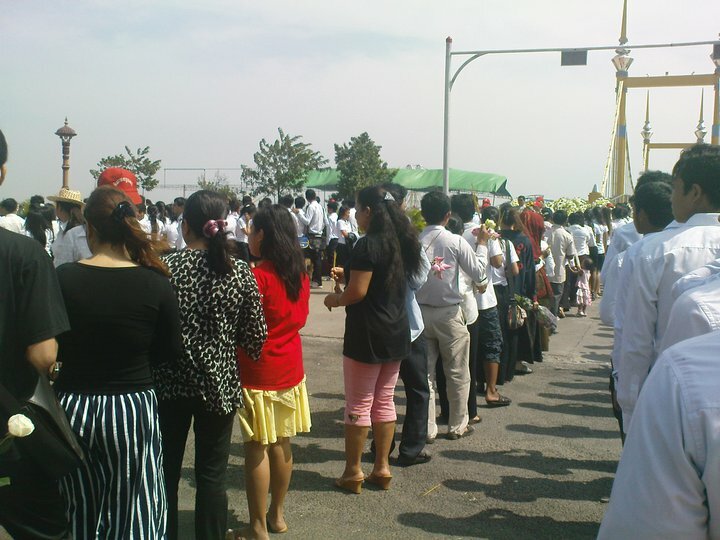 Prime Minister Hun Sen led the mourning ceremony and the crowd was peppered with officials dressed in pressed black suits, mingling with a handful of saffron-wrapped monks and row upon row of well-dressed mourners. We'd heard about it from SomOn. After spending hours browsing Twitter, Facebook and Cambodian news sites to find out about memorial activities, we learned about this morning's ceremony from our tuktuk friend when he picked us up today. While we were supposed to be headed to work, we asked him to make a detour and walked with the other mourners to the bridge. It's a tragedy which has touched everyone in this country. Hun Sen, at the ceremony this morning, reportedly wiped away a tear and burned incense at the site while his wife, Bun Rany, wept openly. 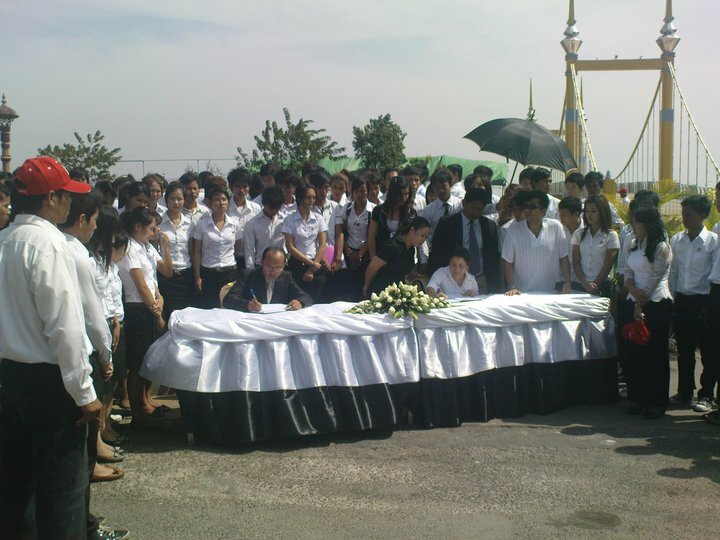 A military band played a mournful tune and there were none of the ever-present Cambodian smiles in the crowd. At work this week, the mood is somber. One colleague is mourning the loss of his neighbour's 20-year-old "beautiful son" and another tells me that someone on their street lost three of their four children. Yet another tells me about her 14-year-old daughter's terror and how she is unable to get out of bed to go to school and begged her mother to leave work early. Along with the sorrow, there is also fear. Fear of the ghosts of those who died and a burning desire to appease their souls by bringing offerings to the pagoda and to the spirits of those who are gone. Everywhere you walk in the city, the pavements are scattered with tiny shrines containing bananas, water and rice; candles shimmering in the warm air and single sticks of incense burning throughout the day. For us, as westerners living in and learning about this part of the world, today is about Cambodia. We plan to stand alongside our new neighbours, colleagues and friends and mourn with them on a day which usually is filled with joy and celebration. It’s never about the turkey, the pumpkin pie and the celebration. It’s about the people.